The transducer is housed in a rigid aluminium casting. An alphanumeric display and three membrane keys provide comfortable operation. Everything is designed according to requirements for user friendliness and ergonomics. Quick and easy access to the connectors is ensured. 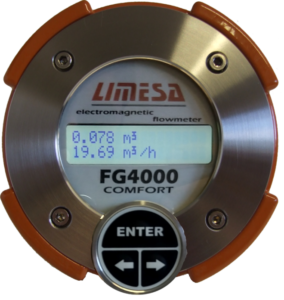 The flowmeter menu is in English, it is intuitive and allows easy configuration. All user parameters, from the flow and volume units, through the selection of displayed units, setting of the pulse and current output settings, can be easily set by a keypad. The construction of the measure unit allows four positions of the flowtube in a horizontal or vertical pipe line while the correct operation position of the stainless steel front panel with display and membrane keys is always provided. The factory standard is a two built-in pulse outputs. One for an information about positive direction of flow and a second for a negative. The second pulse output can be switched to a state contact for information about flow direction. Built-in are two pulse inputs, too. These can be used for a showing of a flow or volume value from an external device on the FG4000 display. The functionality of the FG4000 flowmeter can be extended by an add-on modules, such as the RS232, RS485 or MeterBUS interface, analog outputs 4-20 mA or 0-10 V, temperature module, detection of empty pipe module. 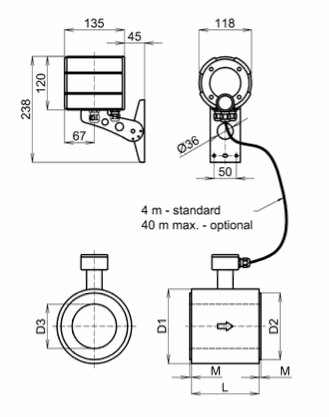 According to ordered specification, the FG4000 measure unit can be powered by 230 Vac, 115 Vac, 36 Vac, 24 Vac or 24 Vdc. The flow meter has ingression rating IP67 while its increased resistance against electromagnetic interference in compliance with category E2 pursuant to EN ISO 4064-5 may be stressed. 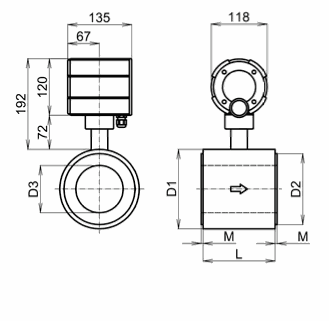 The economical design of the FG4000 Flowmeter transducer has the same connectivity and functional expandability as the COMFORT version. However, the flowmeter is not fitted with a display and a keyboard. The local displaying and control functions are missing. 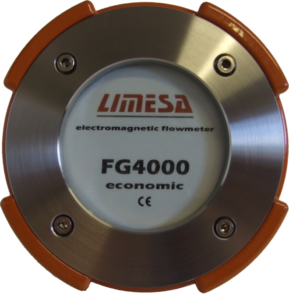 This fact is reflected in the overall price, therefore the FG4000 ECONOMIC flow meters are the most cost-effective option. Without local display, it still fully complies with the requirements for integration into superstructure systems such as third-party visualization programs, super control systems (PLC), controlling of electrical valves, connecting of external counters, etc. The connectivity with these systems is allowed via integrated pulse output, analog output or communication interfaces (RS232, RS485, MeterBUS).